Senner, or Senne, horses are a critically-endangered German riding horse. They are believed to be the oldest saddle-horse breed in Germany, and are documented at least as far back as 1160. They are named for the Senne, a natural region of dunes and moorland in Nordrhein-Westfalen, in western Germany, and live in feral herds there and in the Teutoburger Forest to the east. Senner horses were bred principally as a riding horse, even in times when working horses were in demand; they were also used as a carriage horse. 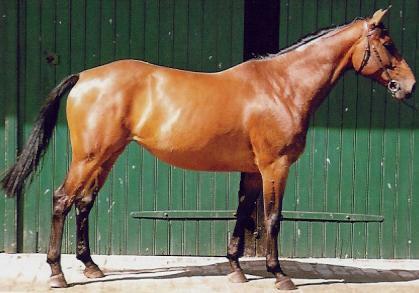 Senner stallions stood at the royal stud of Weil bei Esslingen in Baden-Württemberg and at the state stud of Lipizza in the Austrian Empire. Today, they are competition or recreational riding. They are warmblooded and have been influenced at various times by Arab, Anglo-Arab, Thoroughbred, and Iberian stock. They may have contributed to development of Hanoverian horses. The origins of the Senner are not known; many records of the history of the breed were destroyed by fire in 1945. Herds of feral horses in the Senne moorlands are documented in several Mediaeval sources, one of which dates from 1160. The Senne lay within the Principality of Lippe, and the horses were raised to provide mounts for the ruling Lippe family. The center of breeding was at Detmold until 1680, when it was moved to the stables of the Jagdschloss Lopshorn (de) near Augustdorf. The horses were kept all year round on the heathland of the Senne and in the neighbouring Teutoburger Forest. Numbers were never very high; the number of breeding mares averaged about forty. Breeding records were kept from the early years of the eighteenth century, and a stud-book started in 1713. There were four dam lines in the breed; only one of these, dating to 1725, survives. From the late seventeenth century, some Arab blood was introduced; English Anglo-Arab and Thoroughbred blood was introduced towards the end of the eighteenth century. In the early twentieth century, after the First World War, there was some addition of Andalusian blood. The Lopshorn castle was destroyed by fire in 1945. In 1946 the remaining Senner stock was dispersed to various owners. In 1999, some were introduced to the Moosheide nature reserve to assist in conservation grazing. In 2007 the FAO listed the conservation status of the Senner as "critical". In the Rote Liste of the Gesellschaft zur Erhaltung alter und gefahrdeter Haustierrassen, they are listed in Category I, "extremely endangered". In 2015 the total breeding population was reported at twenty-five head - nineteen mares and six stallions. They are found in bay and grey; black and chestnut also occur. Some horses show primitive markings including a dorsal stripe and zebra-striping on the legs.